Looking for something different to serve to your family and friends at a party this weekend? Well, look no further. Today we are going to look at some popular street food ideas which will be ideal for serving at a get-together or a party this month. You can play around with these ingredients and make up your own ideal combination this week. Avocado on toast for some reason seems to be the meal most associated with millennials. While it’s true that this has risen in popularity a lot recently, it has always been a great choice for a snack at a party. This is because you can add whatever you want to avocado on toast for your own personal taste. You could add some feta, tomatoes, chickpeas, radishes, chicken, bacon and much more. It can be whatever you make it which is ideal for get-togethers. If you don’t know what a Yorkshire pudding burrito is, you’ve never seen street food. When it comes to innovative ideas on the street, there can be nothing which compares to this. It consists of a roast dinner wrapped up in a giant Yorkshire pudding, served with gravy to dip. It’s heaven for many of us, and it can be a super fun talking point and a great recipe to try out on your friends and family. Who doesn’t love jerk chicken? This Jamaican spiced chicken is hugely popular as street food and it is usually served with some coconut rice to offset all of the spice. If you love chicken and a combination of flavours, this is the ideal dish to make for a party or even for a summer barbecue. As you prepare these tacos for your guests, you can make everything apart from the meats the night before and leave them in the fridge. Try to heat up the meat an hour or so before you serve, and this will allow them to be warm when people come and try your food. It can be a no-fuss meal for everyone to enjoy. Everything made me crazy, but the ice creams are really the most exquisite and artistic thing I've seen! Yummy! Oh wow, everything on the list made me starving! I've never heard about Yorkshire pudding burrito before. I would definitely have to try that one day! Wow! These are great options. That pudding burrito looks crazy intense. This list is making salivate here and I am on a diet. Just not fair maybe during the weekend I will treat myself. Hahaha! I feel your pain! Although I frequently include tacos into my weekly meal plans. You can make super healthy versions especially if you go with a more traditional taco. These all look amazing! Of course nachos are always a must but the Yorkshire Pudding Burrito is a new one to me. Its sounds so delicious, Ill be keeping my eye out for this. Thanks for sharing. It is super yummy! I have to alter the recipe slightly but that's the beauty of making it at home. I can make it tailored to my food allergies! I have never heard of Yorkshire pudding burrito but it sounds quite interesting. If there is a vegetarian version I would love to try it. The pudding burrito sounds worth trying right now! I love a good dessert. That, and anything that says burrito in it. Ha! Yorkshire pudding isn't a dessert but it is definitely something you should try once in your life! Then try it in burrito form!! Me and my son likes eating Nachos or Tacos at home while watching movies at home. I like the list that you compile here. Tacos really are great to make for a crowd. They're easy and everyone loves them. Tacos are my go-to meal when I have no idea what to cook. You really can't go wrong. All of these look like they would be so good. I really need to expand my menu - so there are lots of great ideas here. 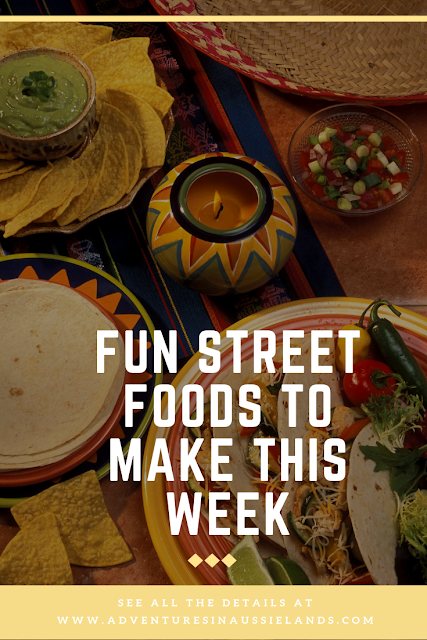 These are some delicious street foods. I noted this list of foods for more ideas. This is such an amazing list and I am drooling here thinking about all of them. I need to do tortillas this weekend now! We just had the Super Bowl yesterday in the US and your street food ideas are just perfect for a gathring like that. Thanks for sharing! Hopefully you tried some for Super Bowl Sunday. If you did, let me know what everyone thought!